Resamples a signal by a rational resampling factor. True Initializes the internal state to zero. False Initializes the internal state to the final state from the previous call of this node. The first time this node runs or when reset is True, this node uses start index to determine when the resampling starts. The next time this node runs and reset is False, the internal state of this node initializes to the final state from the previous call to this node. To process a large data sequence that consists of smaller blocks, set reset to True for the first block and to False for all the remaining blocks in continuous resampling. Input real signal for resampling. The sampling interval of signal is 1. Interpolation factor and decimation factor for resampling. Index of the sample from which the node starts to resample the signal or when reset is True. Set start index according to the signal after signal is interpolated. start index must be greater than or equal to 0. This input changes to resampled t0 when you wire a waveform or 1D array of waveforms to signal. Start time value for the resampled signal. This input changes to start index when you wire an array of numbers to signal. Minimum values this node needs to specify the FIR filter. Minimum attenuation level of signal components aliased after any resampling operation. Fraction of the new sampling rate that is not attenuated. A Boolean that determines whether the input signal undergoes lowpass filtering when this node downsamples the signal. True Applies lowpass filtering to the input signal when downsampling the signal. False Does not apply lowpass filtering to the input signal when downsampling the signal. If anti-aliasing is True, this node protects the resampled signal from aliasing. However, the computation requirements increase during resampling. The sampling interval of resampled signal is decimation/interpolation. Time instance for the first sample of each signal in the resampled signal. The following steps describe how this node completes the rational resampling process. Each step corresponds to a numbered section of the following image. X is the input array for resampling. The time interval between two adjacent samples is 1. This node inserts zeros between every two adjacent samples to upsample X by the Interpolation factor. Let X1 represent the interpolated signal. 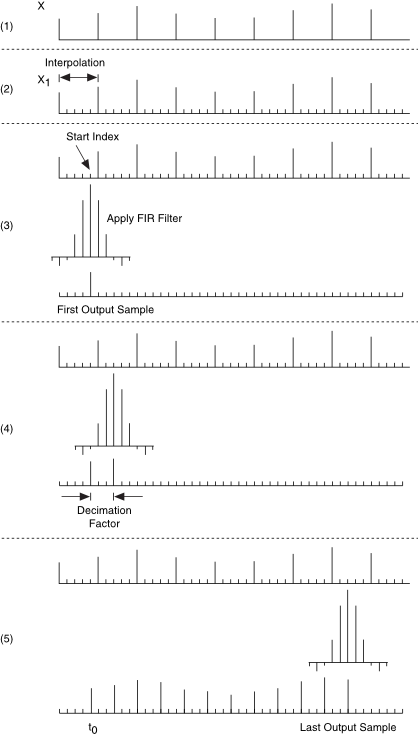 Using a FIR filter, this node filters X1 at the Start Index to obtain the first output sample. The elements outside the range of the interpolated signal equal zero. This node moves the filter to the position Start Index + Decimation Factor and filters again to obtain the second output sample. This node repeats step 4 by adding each new Decimation Factor value until there are not enough samples in X1 for filtering. This node stores the final samples to internal states and wait for the next signal block. The time interval between two adjacent samples in an output signal is equal to Decimation Factor/Interpolation. t0 specifies the time of the first output sample.